In the midst of conversation with ourselves and with others as we speak of being blessed through our time with God, or through going on a missions trip or enjoying His creation on a fall hike, in the back of our minds let’s always remember we are blessed even if we didn’t have a special time with God or go on a missions trip or on a beautiful hike through the colorful leaves. As redeemed children of God we are already blessed because God has already kept His promise from the Garden. He sent His Son – seed of the woman to crush the head of the serpent (Gen 3:15). In so doing, He has provided redemption for His chosen ones. 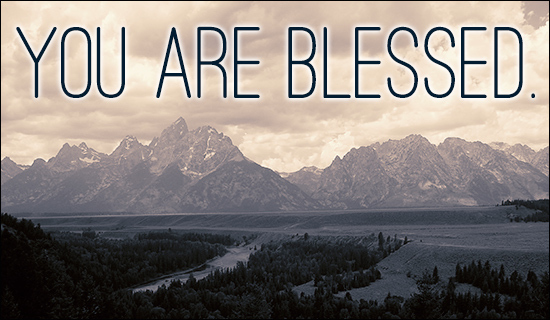 Therefore we ALREADY are and ALWAYS will be blessed. I think if we remind ourselves of this truth daily it will nurture in us a heart of gratefulness. I am redeemed by the blood of the lamb and forever and always blessed. Thank you Jesus for your sacrifice. Is God Only a Fair-Weather Friend?